Credit Sesame is known for providing users with a free estimate of their credit score. The company was launched in 2010 and is headquartered in Mountain View, California, U.S. In addition to free financial advice and estimate of the credit score, Credit Sesame offers identity protection services. Credit Sesame account not only helps you monitor and manage your credit, it helps you protect it, too. When you sign-up for a free Credit Sesame account you get the benefits of bank-level analytics developed with scientists from UC Berkeley and Stanford. Credit Sesame offers a decent and moderately priced identity protection service with $1 million of reimbursement. It took us about 20 minutes to install and setup Credit Sesame account, which is one of the longest setup times among other tested services. Credit Sesame required us to create an account. Users have to enter their name, address, date of birth and Social Security number. It automatically sets up a free service which displays users TransUnion credit score, then users can upgrade it to the paid plan. Credit Sesame offers users to choose from four plans: a Free Membership, Advanced Credit, Pro Credit, and Platinum Protection. Free Membership includes 1 bureau monthly credit score update and one Bureau credit monitoring with alerts. 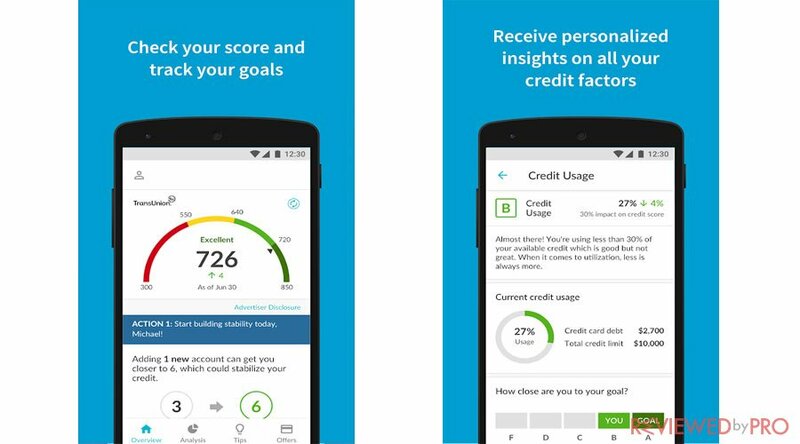 Credit Sesame Advanced Credit in addition to monthly credit score update and alerts, provides users with one Bureau daily credit score updates, three Bureau monthly credit score updates, three Bureau monthly full credit report, and three Bureau credit monitoring, with alerts. The plan costs $9.95 per month. 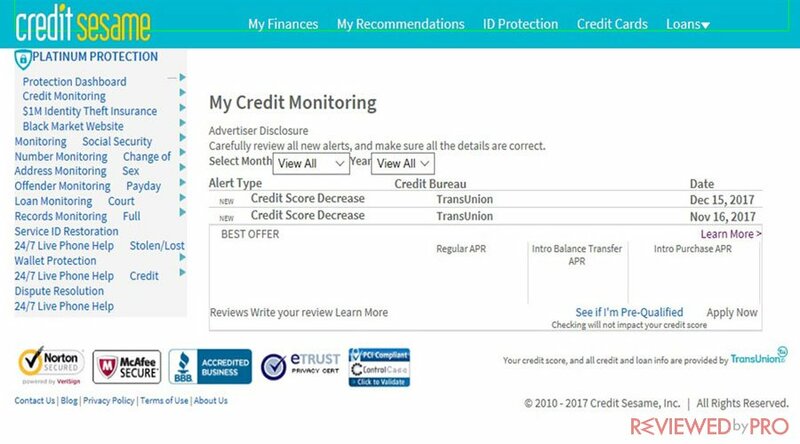 Credit Sesame Pro Credit, in addition to the already mentioned features, offers three Bureau credit monitoring with alerts and 24/7 live experts to help solve credit report inaccuracies. The plan costs $15.95 per month. Credit Sesame Platinum Protection offers all of the features in Pro Credit plan and 24/7 live support for stolen/lost wallet protection, black market website monitoring, public record monitoring, and Social Security number monitoring. The plan costs $19.95 per month. Because Credit Sesame offers users free service, the website is supported by ads and commissions. However, the ads do not go away even for paying customers. The service does not offer any special packages for minors, families or senior citizens. Credit Sesame offers users both the composite VantageScore 3.0 credit score and individual agency scores. Credit Sesame also scans the dark and open internet, as well as public records to check if the users’ data might have been compromised. It monitors personal data such as Social Security number, email address, health insurance, and other identifiers. It also checks changes of address and payday-loan action. 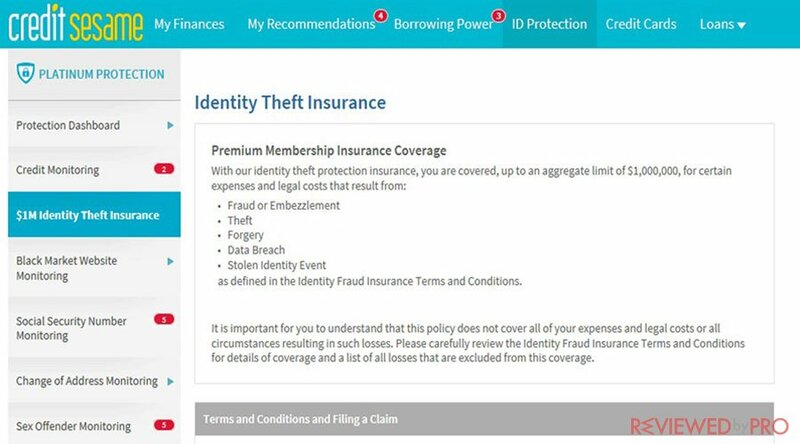 Credit Sesame Premium services offer users the insurance of up to $1 million for legal and investigative costs following a verified case of identity theft. However, the service does not cover losses incurred, as well as expenses. Credit Sesame does not include additional tools such as security software, password manager, anti-keylogging software or antivirus. Credit Sesame alert users via the web interface or mobile applications on smartphones and tablets. Users can also set up alerts via text messages or email. Credit Sesame provides users with wallet protection services. Users can cancel all credit cards and start the process of getting new just by a single call to the Credit Sesame’s support line. Credit Sesame claims to provide 24/7 expert support, however, it was hard to reach any actual human help. The support website is full of ads and other information. It includes FAQs section, Troubleshooting, General Questions, Credit Questions, Debt Questions, Credit Sesame Advice and Recommendations Questions. Credit Sesame’s user interface is bright and open. 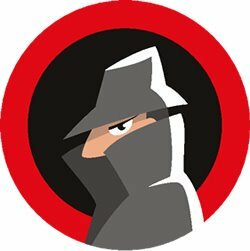 It looks modern and colorful, however, just like many other identity protection services, it tries to squeeze too much information onto a page. The main window displays the current Vantage 3.0 credit rating, and just a click away from the other three bureaus scores. Credit Sesame provides with some more information than many other identity-protection services. Credit Sesame examines the number of accounts that the credit agencies monitor, analyze the total debt level and other information. Credit Sesame also offers mobile versions of the service. The mobile apps are even brighter than the web interface. It includes an Overview page that demonstrates a circular credit-score reporter. The main headings include My Credit, Tips, and Borrowing. Credit Sesame provides users with excellent monitoring services and alerts. In fact, it is a reliable and decent identity protection service that offers $1 million coverage of expenses. However, we did not like constant ads for loans and credit cards, and it was hard to find the telephone number to cancel the subscription. ^ Credit Sesame. Credit Sesame. ^ Credit Sesame for Android. Google Play. This entry was posted on 2018-10-17 at 08:22 and is filed under Privacy.